Charles Baker Willoughby enlisted on 26th April 1916 and was called up for service on the 19th June 1918. His medical records state that he was 19 years 190 days old, 5’9 3/4 inches tall with a weight of 140 pounds, he had blue eyes with a fresh complexion. His occupation was Farm Horseman. He was posted to the 5th Reserve Battalion Sherwood Foresters (Nottinghamshire and Derbyshire Regiment) at Saltfleet, Lincolnshire on the 22nd June 1918. He became ill and was admitted to Louth Hospital on 3rd July, sadly he died on 6th July of pneumonia. 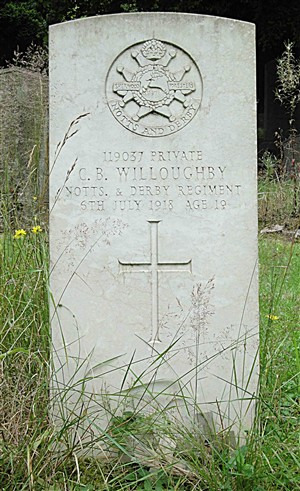 He was the son of Charles and Alice Willoughby of Bridgford Farm, Big Barn Lane, Mansfield. On the 1911 census he was their only child. He is buried in Nottingham Road Cemetery, Mansfield.